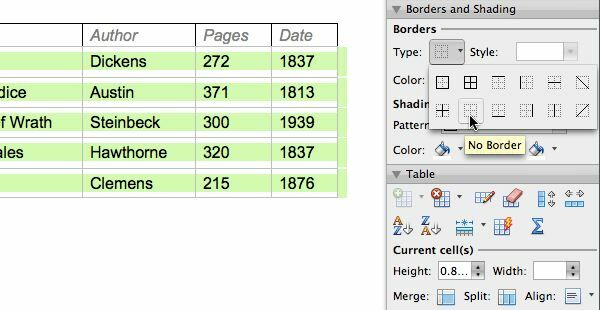 When you create a table, whether using a web app, Microsoft Word or PowerPoint, or even Adobe InDesign, the default is usually a black line around every cell, and little to no space around the content in that cell. That should hardly ever be the end of the process. In MS Office, even applying one of their preset formats offers little improvement (alternating row colors, and assuming certain cell lines). The point of a table is to order and align information in a predictable way — that’s (usually) a good thing. But if the table itself is getting in the way of absorbing or interpreting that information, that’s a bad thing. A subtle truth of design, which I mention elsewhere, is that when things are ‘lined up’ — then your eye/brain can make that connection; meaning, you don’t necessarily even need cell lines at all — or, in any case, they can be very subtle. They certainly shouldn’t compete with or overpower the content that you’re presenting. One way to take control is to start by removing the default border altogether, then consider just adding borders to horizontal lines, reducing the width and/or darkness of the lines, and adjusting the cell height and width to fit the content. Having said all of this, to format a table a certain way is not always the most obvious process to do. As soon as you want to make these lines thinner and those lines a different color, it can get a little tricky.